Private 42543 13th York and Lancs Regiment (Barnsley Pals) Enlisted at Sheffield on 10/12/1915 aged 29 years and 7 months. Height 5' 6 ins, Weight 119lbs, Chest expanded 34 ins, Hair Brown, Tattoo on left wrist. He was killed on 24/10/18, along with 3 of his comrades at Leer, Nord, France. Family information is that they had entered a Church to take shelter and they were either blown up by a shell or the Church had been booby trapped. He was the son of Martha Ann Wilson of 32 Forest road, Bulwell, Notts. 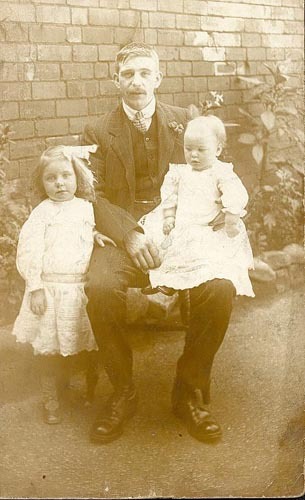 Husband of Bertha Wilson (nee Smedley) of 5 Bastock Road, Owlerton, Sheffield. 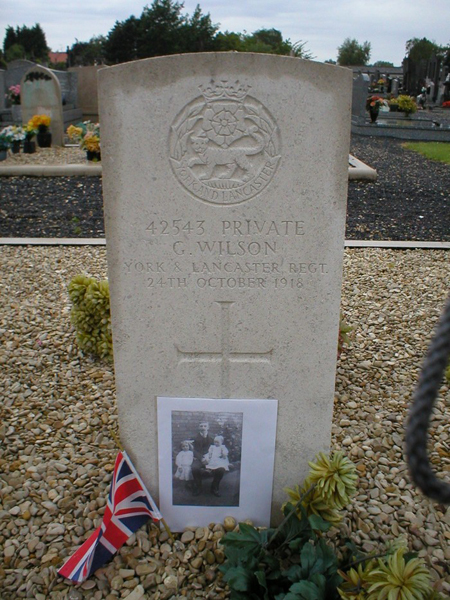 He is buried at Leers Communal Cemetery, France. Private 142719 William Bagshaw, Machine Gun Corps (Inf) Born at Wosborough Dale, Resided at Castletown, County Durham. Serjeant 14/1312 Charles. Rushforth, York and Lancs, MM. Born at Barnsley. Serjeant 18820 Fred. Portman, York and Lancs. Born at Ecclesfield, resided at Chapeltown.